Thank you all so much for your feedback on our opening days and proposed changes. From the 29th January (inclusive), we’ll now be open Mon (10-5), Wed (10-5), Thu (10-6), Fri (9 to 6) and Sat (9-6). We will be looking at longer opening hours on a Thursday night as we move into spring. As you can imagine, we have some ideas for events which will fit with this too! 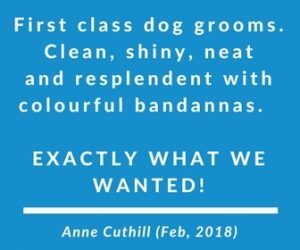 We really struggle to find great dog-friendly accommodation, so whenever we are on our travels, we love to share our reviews. As promised, this week’s fursday blog covers our recent stay at Holiday Cottages Melrose. Pop over to the blog HERE to read more (and well.. there are always a few photos too!). I’ve moved from the oven to the freezer in this week’s recipe. It’s our frozen pumpkin and banana dog treats!! But don’t worry if you are entirely fed up of pumpkin or all run-out. You can swap this out easily for peanut butter, apple or well any dog-friendly fruit or veg. Feel free to have fun with different ingredients! You can find the full recipe and instructions over HERE. Our next available grooming date is now in the first week of March. Do just hit reply or give us a call on 01241 857893. If we have any changes, I’ll make sure we post those dates over on Facebook HERE. Last week, we meet Teddy and his dad who had a grooming appointment with us. Unbeknown to us, Teddy has a very famous brother called Jake the Harbour Dog! 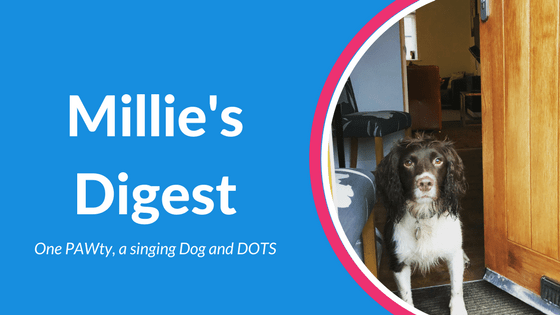 I’ve loved reading all about Jake and his job in Arbroath harbour along with his favourite pastime – Karaoke. You can read all about Jake in this article on the BBC News website but do check out his Facebook page and STV appearance too! If you didn’t catch ITV’s Britain’s Favourite Dogs: Top 100 Dogs, then you have 25 days to watch it over on the ITV website HERE. While I won’t spoil the full list, in case you haven’t seen it, I think Millie was a little bit disappointed that she didn’t quite beat her sister Isla who is a cocker spaniel. Were you surprised by any of the results from the 100,000 survey? I personally loved seeing so many cross breeds listed and loved the Sproodle which is a breed that I’ve yet to meet. From adding pineapple to a dogs diet to changing your dog’s diet completely, there are many different solutions quoted to help stop your dog from eating their own poo (or other dogs too). I love this article published by the Washington Post this week that shares some recent research into exactly why your dog eats poop! On Tuesday we celebrated Millie and Harley’s 4th Birthday with a little PAWty! 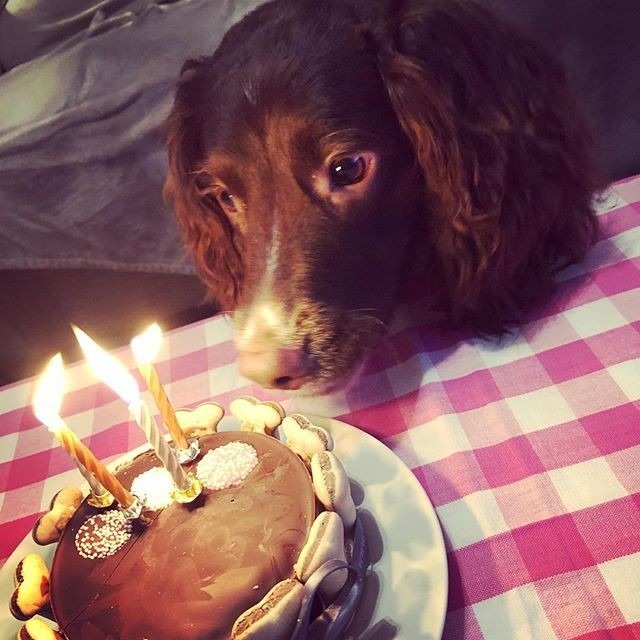 Big thanks to mum for squeezing in a pre-birthday groom on Monday but also massive thanks to Visions of Carnoustie for helping with the birthday balloon and to The Barking Bakery for a fab dog-friendly cake! We didn’t go overboard with presents this time around BUT may have invested in some new nerf balls for our nerf dog tennis ball launcher – video and photos to come ASAP but you can find the full nerf pet range HERE too. I’ve been following Dogs on the Street (DOTS) on Twitter for some time. They are the UKs 1st and leading 24/7 voluntary run support service. They are, in short, a registered street ran vet practice for the homeless community with dogs. The work they do really does make me want to cry when I read their updates as they often go above and beyond the free vet care that they offer. This ranges from extra sleeping bags, dog jackets, food, grooming and even support finding accommodation or temporary hotels etc that will accept dogs to provide their owners and them with some respite. Just recently they have launched the 1st homeless community with street dogs mobile veterinary vehicle which enables them to drive around London stopping and supporting street dogs all over. I love the concept and I love their work. I have my fingers crossed that they will be coming north of the border soon but I’d love to know if you are aware of anyone doing similar work or looking to do this type of work in Scotland? We’d love to get in touch with them if so. Be the first to get our free eBook with all 8 homemade dog treat recipes. We'll be releasing this at the end of our 8 week blog series early March.